Wait! Before you spend thousands on landscaping—or on water-guzzling plants—try planting a DIY drought-tolerant garden. With the right plants, your landscape will be cost-effective, low maintenance, and beautiful. Here is a list of ten plants that won’t break the water bank but will still let you enjoy lush greenery and flowers without having to replant every year. Just be sure to check your hardiness zone and your zone’s growing calendar before planting anything not mentioned on this list to ensure it can withstand your climate. Goldenrod is so easy to grow that some people call it a weed; it springs up practically everywhere once planted. If you don’t mind prolific yellow tufts that look cheerful in the late summer afternoons, then you’ll love goldenrod. 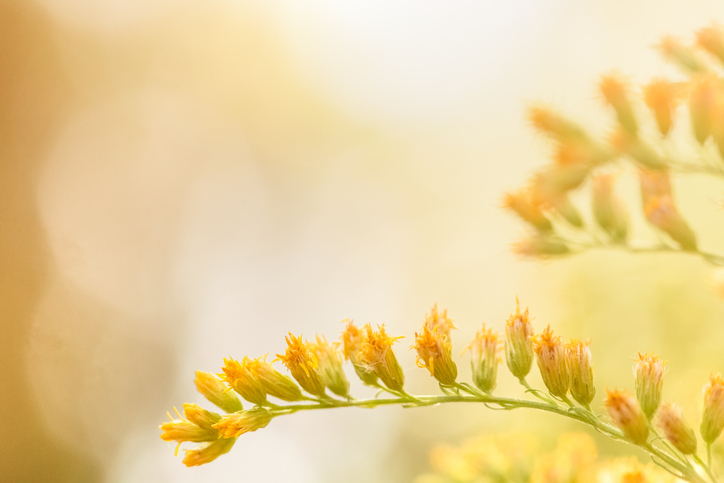 These flowers top out at a couple feet high and bring lots of pollinators like butterflies and honeybees to your garden, so other plants will naturally grow and flourish. Juniper bushes are evergreen, providing a perfect backdrop for other plants during their growing and dormancy cycles. Whether it’s in the dead of winter or summer, you’ll have these fragrant and green bushes to look at. If you’re into attracting nature, you’ll especially love juniper; it was named one of the top 10 wildlife-friendly plants. Baby’s breath is ideal for garden filler flowers, bouquets, drying, and water-conscious people. This low-growing plant blooms all throughout summer and comes back each spring to do it all over again. For a flower with healing powers, it’s amazing the purple coneflower doesn’t need much TLC itself. This flower loves full sun and soil that’s part sand, clay, and silt (loamy). Plant purple coneflowers in the summer, water until they’re established, and then enjoy purple, red, pink, and white flowers every summer and fall thereafter. Echinacea is beloved by butterflies too and grows well in nearly all hardiness zones. Seeing lush, beautiful blooms in the desert is a real treat, which is what makes the desert zinnia so rewarding. Just plant the desert zinnia once, and you can watch it bloom for months out of each year with little to no effort on your part. It’s perfect for hot, dry, and sandy southwestern states because it can withstand droughts and it comes back each year. Plus, its flowers are bright white, so they integrate easily into your other landscaping plans and color schemes. Start these plants from seeds and enjoy them for years to come. The prickly pear is a cactus—ideal for desert climates. It also provides your landscaping with added security. These plants grow one-to-seven feet tall and may be planted around entrances to limit burglar hiding places and deter access. The prickly pear also looks pretty—with vibrant flowers in summer—and produces fruit for your family. No one other plant on this list has all these benefits. If you don’t have a green thumb, you’ll love the daylily. It grows perfectly well in most hardiness zones and doesn’t have a soil preference. Add on the fact that daylilies don’t have diseases or chronic pests, and it’ll be one of your favorite plants on your property. Once planted, enjoy brightly colored blooms without worry. The lilac is a low-water tree that never grows more than fifteen feet tall, making it perfect to add depth and dimension to your garden. Lilacs rely on the hard frost of the Midwest and Northeast to set its buds and return with velvety soft purple and pink flowers each spring. After the root system develops, you won’t need to do much more than pruning and fertilizing once per year. Sage is a perennial drought-tolerant herb. Though sage dies off in the winter, you can cut it back at the end of the summer, dry the leaves for cooking, and watch fresh new shoots emerge in early spring. The honeybees go crazy over the bright purple flowers that bloom in late spring, helping the plant double and triple in size in just a few growing seasons. Yarrow is a lovely, bushy perennial that shows off yellow, red, orange, white, and pink flowers each year. It’s perfect for southern areas because it can stand the heat and some cooler temperatures. Yarrow loves full sun and well-drained soil. If given ideal growing conditions, you won’t have to water it at all and it’ll still grow to about four feet tall. Plus, local deer and rabbits don’t generally find yarrow appealing, so it’s less likely to get munched on. Planting with purpose saves you money, time, and precious water. Plus, in some cases, the plants you choose can enhance your yard’s security or offer medicinal and nutritional value. Get to planting so this season and seasons to come will be more water-conscious and beautiful. Which of these plants are you most interested in? Share in the comments. I’m only interested in Baby’s Breath! They are small and very cute! I also love the color a lot!